In the wonderful city of Milan, I dined in the drawing room. Was this an appalling breach of social etiquette, an outrageous solecism, a slide into the worst excesses of anarchism? No. Let me explain. In 1867 a huge shopping gallery of cruciform shape (nowadays people might call it a ‘mall’) was opened on the north side of the cathedral, in the very centre of town. Like most things in Italy at that time, it was named after the King. Very soon, because of its grandeur and its enormous popularity with the local citizenry, the Galleria Vittorio Emanuele II was known by a new name – Il Salotto di Milano (Milan’s Drawing Room). 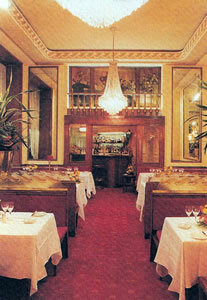 And here, for well over a century, has been located Milan’s most famous dining room: the Ristorante Savini. I cannot resist the temptation to reproduce for you a picture of one of the greatest singers ever to thrill the human ear. 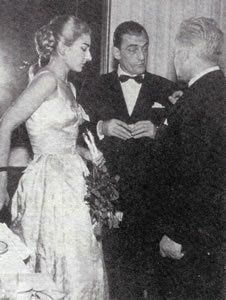 It shows Maria Callas at Savini, in the company of Luchino Visconti. For the restaurant is but a handful of steps from the opera house, and few stars have warbled at La Scala and not passed through the doors of Savini. Indeed, those who have distinguished themselves in the worlds of music, literature and film have all flocked here over the decades. Giuseppe Verdi, Ernest Hemingway and Charlie Chaplin all came to sit on the plush red velvet and tuck into the traditional Italian food. That word ‘traditional’ sums up the enduring appeal of this place. I settled onto the banquette under the bright crystal chandeliers. Before me was a tablecloth of white damask, upon which stood decent glasses (Schott for the red, Nachtmann for the white) and a silver vase with a single red rose. I looked up to a faux gallery, where a (painted) orchestra serenaded the (painted) diners in the dress of the 1890s. This was the sort of place – luxurious, comfortable and proper – in which I expected to find a head waiter in black tie, who had been here for 25 years. And I did. 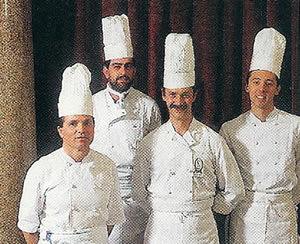 Sergio Arreghi proved to be a most affable and courteous fellow. Together with the General Manager, Massimo Leimer, he ensured that my evening was relaxed and highly enjoyable. As you would expect, the cellar is full of Italian bottles, with prices starting at 25 euros. The 2003 vintage of the splendid Luce is 200 euros and Mr Gaya’s 1999 Barbaresco Sorì San Lorenzo is 520 euros. France offers some serious temptations, however, with Krug Grande Cuvée champagne at 250 euros, that fine claret 1996 Cos d’Estournel at 370 euros and the Louis Latour 1998 Montrachet at 600 euros. I was pleased to note a fine sweet wine from Alsace – 1981 Gewürtztraminer, Sélection des Grains Nobles, Hügel & Fils (350 euros). On Sergio’s advice, I went to a Sicilian producer for my drinking. My white was made from viognier and insolia grapes, and yielded a nutty nose and fresh acidity in the mouth (Ficiligno, Baglio di Pianetto, 2004). My red was a blend of merlot and shiraz. Full-bodied and tannic, this needed its decanting and was full to bursting with damsons and black cherries (Shymer, Baglio di Pianetto, 2002 – 45 euros). After dinner Signor Leimer took me on a little tour. I can therefore tell you that there are some delightful dining rooms on the first floor, should you require privacy for your party. These can be reached via a discreet side entrance, so that you can slip in and out of the Ristorante Savini without being noticed. I rather liked the idea of marching out of the front door. 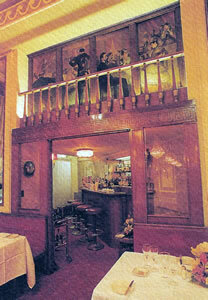 Which is what I did, very happy indeed with my experience of dining in Milan’s Drawing Room. 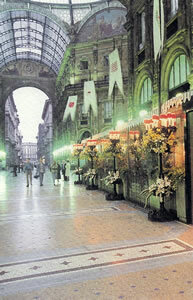 Galleria Vittorio Emanuele II, 20121 Milan, Italy.